These rude tents on Gunner's Point gave a modicum of shelter to the occupation party left behind by the Transvaal on Marion Island. THE FIRST RADIO signal to be sent from Marion Island went out within a short while of the Transvaal's occupation party being landed on January 4. Among other equipment they had brought with them the "walkie-talkie," which was set up on the promontory overlooking the landing beach. The first radio message was timed 11.5 a.m. and, sent to the Transvaal, read : "From H.M.S.A.S. Penguin (the code name allocated to the island's radio station in order to hide its true identity). Last boat just landed. Intend closing down radio telephone watch. Will keep visual signal watch." Immediately they came ashore the occupation party set to work to prepare their camp. Though the beach was well protected from the northerly and westerly directions, from which most of the wind apparently came, it could not be used as a camping site, partly because it was composed entirely of boulders and partly because it was occupied by sea-elephants and penguins. There was no other shelter anywhere except what little might be found among the lava outcrops on Gunner's Point. It was already evident that no camp in the open could hope to withstand the force of the wind that blew on Marion. The general sogginess of the ground also made such a site untenable. Apart from the fact that there was not a square foot of dry ground to be found anywhere, the wet, decayed vegetation that formed the top-dressing of the island allowed nothing to get a firm grip in it. Anyone who stood for only a few minutes on even the firmest ground found himself slowly sinking down, and water oozing from the depression over his feet. It was necessary to wear seaboots continuously. 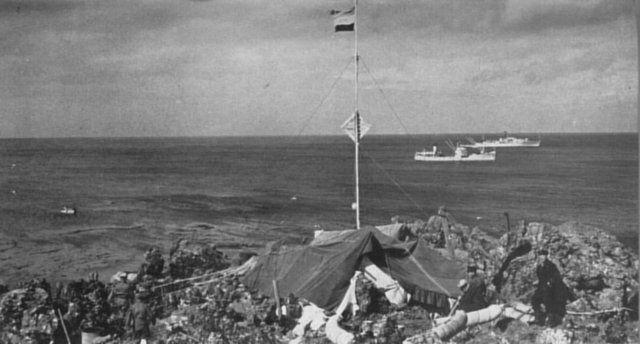 from the poles and the four tarpaulins brought ashore, among the lava outcrops on Gunner's Point. One would house the ratings, and a smaller one the officers. The rugged nature of the rocks allowed good purchase for the tent ropes. Hauling the materials for the tents, their kit, and stores enough to last them two days, to the cliff top kept the men busy the whole day. They broke off at 1 p.m. for a hot meal, produced by Schott and ravenously consumed. Heavy physical exertion in this cold atmosphere undoubtedly sharpened the appetite. Later it became necessary to order a 50 per cent. increase in the ration scale because of this. under the grass. Anyone thus disabled out of sight of the camp might easily die of exposure before he was found. Towards evening the weather began to deteriorate again. The wind increased to a fresh breeze, and fog settled over the sea. When darkness fell the Transvaal had not returned. The men turned in, tired out after their hard day's work. Sleep did not come easily, however. It was freezingly cold, the wind moaned through their roughly-fashioned tents, and towards morning a drizzle found many openings in their tarpaulin shelters through which to add to their discomforts. To make matters worse, neither groundsheet nor anything else seemed able to prevent the water rising from the ground and soaking their bedclothes. The second day on the island was spent in bringing up stores from the beach, fetching water from the stream, and making the tents more weatherproof. Efforts to dry the blankets and clothes that had got wet during the night did not meet with much success. It was soon apparent that there was almost as much dampness in the air as there was in the ground. Experience proved that nothing ever really dried by natural means on Marion and Prince Edward. The only way to dry anything was to hold it over a heater. Fog continued to hang round the island until late afternoon. Soon after it cleared the Transvaal hove in sight. She came to anchor, and after supper landed Lieutenant Grindley and Lieutenant Berelowitz to complete the occupation party. They explained that their return from Prince Edward the previous afternoon had been hampered by the fog. It had cleared momentarily - just long enough to show them Marion close up and the ship near the reef. They had turned in haste and headed seaward again, and throughout that night and the morning had been lying well out, waiting for the fog to lift. Edward Island they had seen what looked like signs of volcanic activity. Wisps of steam or smoke had been noticed rising from the side of a donga on the left slope of the hill behind the cave. Fairbairn had reported by radio the annexation of Prince Edward Island. The D.C.G.S. had replied promptly: "Delighted news consolidation 'William'. Hearty congratulations." He had also asked Fairbairn to report whether there were any caves or old buildings on Marion suitable for housing her shore party and thirty-three sappers, who would be arriving later. Fairbairn had replied that no huts had been seen. All the caves were at sea-level and were occupied by seals and sea-lions. All aboard the Transvaal were by now heartily tired of the islands and their impossible climate. They were looking forward with keen anticipation to their departure for home that night. The one who was probably counting the hours most eagerly was Lieutenant Berelowitz. However, he had not taken into his calculations the unpredictable workings of the official mind and the speed of modern communications. Even while the Transvaal was approaching Marion ih order to put Grindley ashore, she received radio instructions from Pretoria to land the Medical Officer also. Should conditions not allow this he was to be transferred later, at sea, to the Natal. She would take him back to the island. signal lights, and over the radio they joked breezily with the departing ship until she was out of range of their "walkie-talkie." When she had gone, the 14 men left behind began to realise for the first time how quiet and lonely it was here on the island. During their two days ashore they had seen little of the ship, but the knowledge that she was in the vicinity and would put in an appearance as soon as conditions allowed had given them comfort and confidence. Now that they knew she was hurrying away from them, and that at least a week must elapse before her relief arrived, they became aware that they had voluntarily entered into true exile. They were left without any means of contact with the outside world. Grindley's orders from his commanding officer were concise and clear. Should any foreign Power land, he was to stress that the island had already been annexed by the Union of South Africa. Nevertheless, he was to avoid any incident with the intruders. While awaiting the relief ship he was to assist Captain Anderson in surveying the coast for a suitable site for a harbour and breakwater. As a personal request Fairbairn had asked that any unnecessary bloodshed or cruelty to the animals or birds on the island should be avoided. flying-boats or seaplanes to be hauled out of the water. Anderson's rough estimate was that it would take the party of sappers who were coming to the island about nine months to do this work. Tests showed that it would be wise to filter all water for drinking on this portion of the island. On the way down the coast the explorers had noticed a number of large black hawk-like birds circling curiously above them. They did not pay them much attention, but when they turned into the wind on their way back to camp they soon noticed the peculiar manner in which the birds were now behaving. Soundlessly and with startling suddenness one of them shot by from behind, at neck level and only a foot or two away. It soared away in a deep curve, and before the men had recovered from their surprise another swooped down and repeated the performance, followed by others in rapid succession. They seemed to aim for the men's necks, swerving away at the very last moment. Sometimes their wing-tips brushed the shoulders of the men as they dodged out of the way. They were huge birds, two or three times the size of the usual sea-gull, and they had short, curved beaks and webbed feet equipped with sharp talons. They were later identified as Skua gulls. shots and the fate of their fellows apparently cooled the ardour of the others. As Grindley and Anderson struggled on towards the camp they left the Skuas circling above the bodies of the fallen ones. Soon they were rending the still-warm carcasses with beak and talon. Grindley and Anderson were away from camp more than seven hours, but owing to the rough going they had covered only five or six miles. Up to now South African time, two hours ahead of Greenwich, had been observed on the island. Since its position, however, was about 20 degrees east of that of Cape Town, and it was so much nearer the South Pole, dawn was coming to Marion Island at three o'clock in the morning, according to the watches of the occupation party. They were used to being up with the dawn, but they did not favour getting up at 3 a.m. It was therefore decided to introduce a time system more fitting to the meridian on which the island was situated, and all watches were accordingly advanced two hours. Dawn would now come at about 5 a.m., and darkness at about 10 p.m.
On the third night a strong gale came up from the west, and gusts of 45 to 50 m.p.h. threatened to blow the whole camp into the sea. The men had to turn out repeatedly to make secure tarpaulins and lashings that were working loose. As a safety measure all the paraffin stoves were extinguished, to obviate the risk of fire should the tent be blown down. Consequently the men nearly froze with cold. The wind continued to blow strongly all through the following day, which was spent in making the tents fast and in closing channels of entry for the wind. All the stone required for holding down the edges of the tarpaulins had to be broken from the lava outcrops. the island. He also directed that nobody was to leave the camp without carrying either a rifle or a pistol, which, it was already apparent, was necessary to provide protection against attacks from these birds. A heavy mist covered the island on the fifth day, but despite this, after assisting to cache their stores of explosives at a safe distance from their camp, Grindley, McMurray and Schott set off early in the afternoon to inspect the beaches along the north-east coast. They walked for two miles but the mist became thicker as they approached the channel between the two islands, and they realised it would be dangerous to proceed with their original intention of pushing through to the cove marked "Landing Place" on the Challenger's chart. They were disappointed, for they had hoped to see how much was left of the wreck of the Solglimt, and whether any of the huts reported on that part of the coast many years earlier were still standing and habitable. Having enjoyed a much-needed wash and shave in a stream on the way the three men returned to camp late in the afternoon. Grindley by now had realised that there was little hope of examining the coast for any distance from the shore side as walking was too slow and exhausting. It seemed that a high-powered motor-launch was necessary in order to inspect from the sea. names on its surface, so that there should be permanent record of their part in this historic adventure. Friday, January 9, when the flagstaff was transferred to its permanent site, was the hottest yet recorded on the island, the temperature reaching 60 degrees Fahrenheit. For the first time the men were able to discard their heavy clothing, and some later complained of having been sunburned ! The effort required to walk over the unresisting, sodden ground was now beginning to show its effect. Both Anderson and Petty Officer Sorensen were laid up with strained knees. It was obvious that some kind of facilities would have to be provided to assist the Natal, and any ships following her, to land their men and supplies. Grindley, Anderson and McMurray therefore conferred and eventually decided that a scheme, proposed by Grindley, for hanging a light landing-stage and catwalk over the edge of the cliff was the only practicable one. timber baulks when there were no more of the latter, to be had. As it happened, the Natal did not turn up on the Sunday. She was sighted early the next day, however, and immediately the good news was being shouted through the camp. The seas were too heavy for her to come into the anchorage but she exchanged signals and then stood off. The men were disappointed for they had been eagerly awaiting the arrival of their reliefs, and looked forward to enjoying once again hot baths, fresh food and dry and warm habitation. They had been anticipating almost as keenly the receipt of mail and news of the outside world. Despite their disappointment, however, the spirits of the men were high now that relief was in sight.